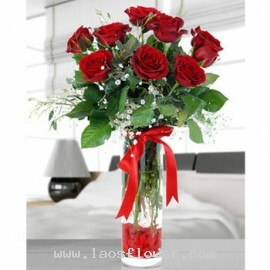 8 roses, eight is an auspicious number of Chinese people. 8 is a lucky number. 8 roses, in Chinese eight pronounced "pa" and a voice similar to "fa" and is meant to convey prosperity, wealth and fortune, so the number 8 is considered a lucky number by the businessman. It is such an auspicious number in China that number is 88 or 8888 or more 8. They mean a happier and make them feel more fortunate enormous. 8 pink roses arranged in a glass vase accents with pink wax flowers or white gypsophila flowers and fern leaves. The color of roses can be changed as you want. Occasionally, substitutions may be necessary to create your bouquet due to the availability of certain flowers in various parts of the co..
8 red roses arranged in a vase accents with white gypsophila flowers and tied with red ribbon. * Roses color can be changed as you want. Occasionally, substitutions may be necessary to create your bouquet due to the availability of certain flowers in various parts of the country. 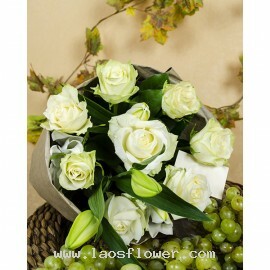 Substitutions ma..
A bouquet of 8 white roses accent with purple caspia. Wrapped in blue paper and tied with purple ribbon. The color of roses and all materials can be changed as you like it. Please request when you order it. Occasionally, substitutions may be necessary to create your bouquet due to the availabilit..
White Bouquet consists of 8 white roses and 2 white lilies arranged as a hand tied bouquet wrapped in brown paper and tied with white ribbon. This bouquet is perfect for sending to your lover on the wedding anniversary. The color of the flowers can be changed as you like. Notify us by email after or..